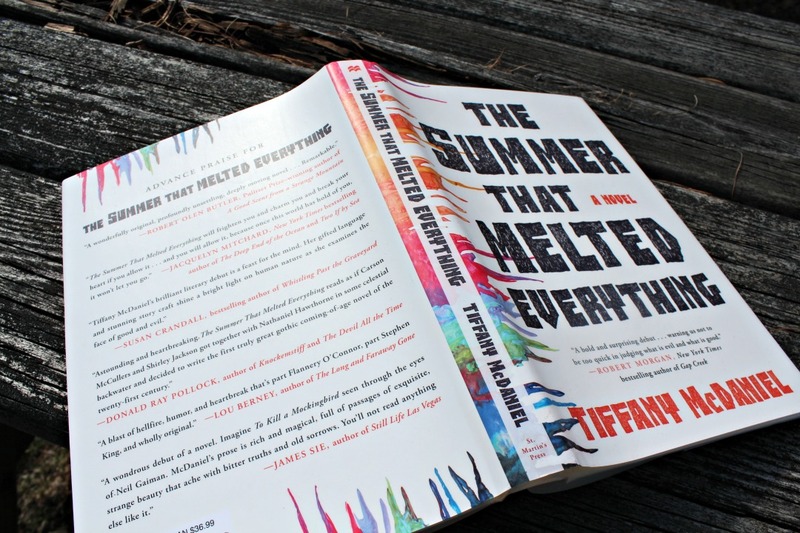 The Summer that Melted Everything had it all and more. It had writing that makes you weep from its beauty, characters that are so alive you can swear they whisper to you, and a plot that leaves you with more questions and answers. 1984 was the summer that the devil came to Breathed. It will never be forgotten by Fielding and his family as not only the hottest summer, but the summer that they welcome the devil into their home. Sal appears unannounced and out of nowhere, claiming to be the devil, and the Bliss family, assuming he’s a lost child, take him in. But while some assume he’s merely making things up, there are a handful of town folks who may truly believe. As the summer drags on, the tensions rise and the inhabitants begin to see the devil everywhere they look. It just takes one person to stir the pot and before the Bliss family knows what’s happened, the pot is about to boil. What you’ll notice first from this book, is its fantastic writing. The way there are sentences that strum a chord within your heart, so beautiful you want to speak them aloud just to savor them on your tongue. But the language is not merely beautiful, instead transcending beauty to find words that communicate honesty and the feelings we hide in the crevices of our hearts. Each sentence becomes a clue, a hushed secret which gives you fleeting glimpses of worlds merely hinted at. Such as, “If looks were to be believed, he still was just a boy…I knew he was old in the soul. A boy whose black crayon would be the shortest in the box”. (13). The pages melt away as the writing pulls you in immediately from the beginning. However, that’s not all that McDaniel gives you. McDaniel paints portraits of phenomenal characters from the heroes to the neighbors that balance their quirks with their humanity. These are not simple paper people, toppling over in the wind, but they’re complex and startlingly human. With real flaws, truly ugly moments, they are more human than most characters we read about. It is in the moments we dislike them, when we can see in their cruel words and fear a mirror reflection of us on our worst days that they come alive. A whole range of characters, there are those you can’t help but love, those you can’t stand, and those you don’t want to admit remind you of yourself. These characters, these human souls, are woven together in a truly masterful story. Brilliantly crafted from the Paradise Lost quotes at the beginning of each chapter, all the way down to the imagery of heat and ice cream, the story is art. Each detail comes together and even the parallels between the past memories of Fielding, to his experiences reflecting back on his life in Breathed, uncover a richly complex story. The mix of historical prejudice and religion in the South is merely one feature of this story which gives it life, dimension, and depth. Darkness and depravity, blame and blasphemy, Breathed takes a breath of its own. It becomes a town consumed by fear, blinded by their own demons, imagining monsters in the shadows. And it keeps getting better and better as the pages fly by until you are left turning the last page and wondering which way is up. At the end we not only question who Sal is, but who we are and what lies at the root of humanity when our hearts are twisted by fear and anger. All of this, the gorgeous writing, the complex characters, and intense plot culminates in penance, guilt, and our own fall. This story is not just one thing, but more like a scale that changes color in the light depending on how you turn it. It is a family story, a community story, of heat, fear, and prejudice. We witness the secrets of its characters and the way fear can make monsters of us all. It is a mystery story. One of unanswered questions, unexplained appearances, and the nature of doubt. It is a story of redemption, guilt, and a life full of regrets. It is a story with people at its core, peering deep into our soul and seeing our depravity, our mistakes, and our ability for forgiveness. A story of emotion, a whirlwind rollercoaster that takes you higher and higher and seems to leave us suspended at the top, unsure how to get down. We are forced to question the characters, their actions, human nature, and ourselves. Questions left unanswered, the echoes ringing on into the stillness: what would you have done? It is a plot that makes you think: a story of guilt, trauma, and perception all captured in a summer we can never walk away from. You can buy your own copy at Amazon, add it to Goodreads, or visit the author’s website. Let’s Discuss: What has been the most influential book in your life? Thanks for your review. I’ve been reading a bit about this novel since it first caught my eye & yours is the review that’s tipped the scales in Melted Everything’s favour! Perfect! Let me know what you think when you’re done! !